A clear indication of the ongoing changes in the global market is that the number of exhibitors from Asia and the overall area booked by Asian companies has increased significantly at the upcoming K2013 show in Düsseldorf, to be held from 16-23 October. The exhibition area of the largest five Asian countries of China, Taiwan, India, Japan and South Korea has grown by almost one third, more than 25,000 sq m in 2013, compared to 18,000 sq m in the show in 2010. This was highlighted at the K2013 preview in early July by Werner Dornscheidt, President/CEO of show organiser Messe Düsseldorf. He also noted that Germany still leads the exhibitors slot, having booked 43% of the overall exhibition area of 170,000 sq m. Trailing behind is Italy (26,000 sq m), China (9,600 s qm), Austria (8,100 sq m), Switzerland (6,400 sq m), Taiwan (6,100 sq m), and India (5,300 sq m). Meanwhile, Turkey will display its products and services in almost 4,000 sq m of net exhibition area, which is 1,000 sq m more than three years ago. 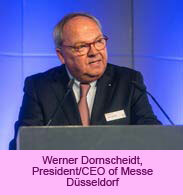 Despite the uncertainties, Ulrich Reifenhäuser, President of K2013, is carefully optimistic. “Some global regions such as Japan show significant growth, others like the US, are experiencing a slight recovery and China is anticipating a 7% rise of its economic growth in 2013.” Nonetheless Reifenhäuser anticipates a stable year, with at worst, a slight decline and is convinced that the K2013 will revitalise the industry. Traditionally, machinery suppliers make up the largest exhibitor group and this year, they will take up 119,000 sq m of space, more than two-thirds of the overall exhibition space and 4,000 sq m more than 2010. The next largest group comprising raw materials, semi-finished goods and industrial components, will take up an area of 37,500 sq m, almost 3,500 sq m more than 2010. Overall, 3,100 exhibitors from 60 countries will participate in the triennially-held show.